SRAM just introduced a new version of their top-end road group, Red, with a different approach to gear ratios that they claim gives more range and tighter spacing. This smelled like marketing hokum to me. The big idea with SRAM’s “x-range” is that they’re using substantially smaller gears front and back: while most groups have an 11-tooth sprocket as their smallest, x-range starts with a 10 and goes up from there; in the front, a 53-tooth chainring is the biggest in common use on a road bike; for SRAM, a 50-tooth is the biggest. I enjoy nerding out on gearing charts, so I decided to make some spreadsheets to check their claims. In each table, the leftmost column indicates the teeth on the sprockets in back, the top row indicates the teeth on the rings in front. Gear-inch figures in gray are for combinations that would go unused when you cross over to the other chainring. The crossover can happen at a different point, but the same total number of combinations would wind up going unused. Similarly, big/big combinations and little/little combinations have a gray background to indicate that these are cross-chained, which some manufacturers (and cycling tradition) recommend against using. The columns trailing the gear inch columns show the percentage step from the next-harder gear (although there is a next-harder gear for the little/little combination, I’m not calculating that here). The steps are color coded relative to the average step for that setup. Anything that is within half a standard deviation of the average has a white background; for each standard deviation away from that range, the steps are darker shades of blue (going down) and green (going up). I’m treating the average step as the “sweet spot” for that group. Steps that are so close together that we don’t notice the difference are a waste, and I’m trying to reflect that here. 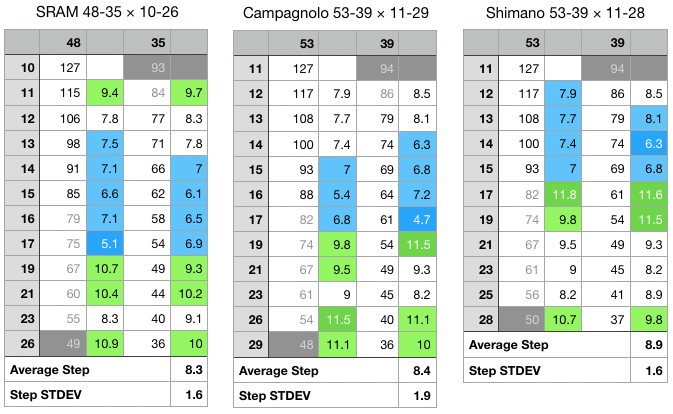 What we see from this is that SRAM’s group has a slightly closer average step than Campagnolo’s (there’s a little more variability between steps with Campy too). 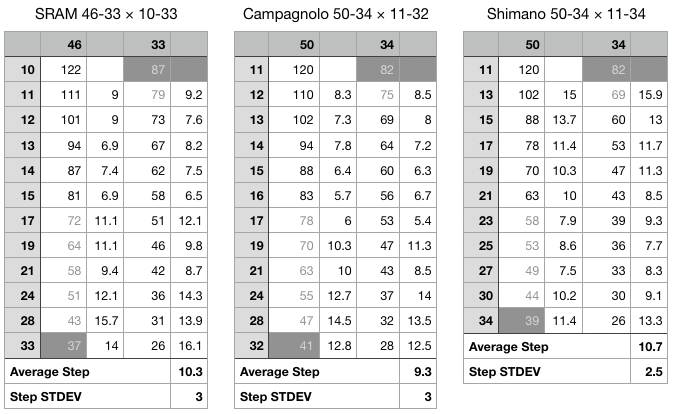 With SRAM, all but one of the shifts are within one standard deviation of the sweet spot; with Campagnolo, all but three are; with Shimano, all but four are. Note that I am intentionally not addressing the number of “1-tooth” jumps that SRAM mentions in their marketing materials. We don’t notice whether a jump is one tooth different or not, we notice whether it’s closely or widely spaced. As these tables make clear, a 1-tooth jump can be wider on a percentage basis than a 2-tooth jump. The total range that SRAM achieves in this configuration, 352% is precisely the same as the one Campagnolo achieves, and slightly better than Shimano achieves (343%). One interesting thing that shakes out of running the numbers is that SRAM is misrepresenting their chainring options: They offer three fixed pairs of rings: 50-37, 48-35, and 46-33, which they claim are equivalent (with their x-range cassettes) to the more conventional 53-39, 52-36, and 50-34 (with more conventional cassettes). 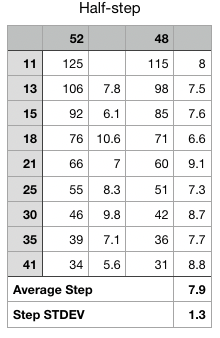 But as these tables make clear, their 48-35 is precisely equivalent to a 53-39 when using corresponding cassettes. The 50-37 will be overkill for all but the strongest riders–I’m not even bothering to set up that table. So is SRAM’s claim bogus? Somewhat to my surprise, no–my guess was that by scaling everything down, the coarse granularity of one-tooth jumps at the pointy end of the cassette would undermine their claim of wider range with closer spacing. And it is true that those jumps are relatively coarse (although not unacceptably so). But overall, they have close average spacing with relatively consistent steps. Their chainring combinations are too aggressive though–their 50-37 just doesn’t make sense, and they could have slid everything down a couple of teeth so that their smallest combo was 44-31, which would have give the rider essentially one more low gear at the bottom without making a meaningful sacrifice at the top end. I’m a little puzzled that they went with a 13-tooth spread when 16-tooth spreads are common and people are even getting away with 19. I expect this choice was driven by shifting speed, but a 16-tooth spread would essentially add an extra gear at one end and remove a gear of overlap in the middle. One optional feature that SRAM has added to their electronic shifting is sequential shifting–the system will always figure out what the next-highest or next-lowest gear is, even if that means making a shift in front and shifting across a few gears in back. Shimano already offers this. Campagnolo doesn’t. Sequential shifting opens up a possibility for something that would be really radical in today’s market: half-step gearing. With half-step gearing, the sprockets on the rear cluster have wide jumps between them, and the chainrings have a narrow jump. In practice, in order to move through the gears in the correct sequence, the rider would shift in front and in back on every even-numbered shift, and shift only in front on the odd-numbered shifts–the closely spaced chainrings fill in the gap in the rear cluster’s wide spacing. Whereas the crossover gearing that all modern systems use waste a lot of the potential combinations, half-step gearing puts every combination to good use. This was important when people had 2×4 drivetrains. The drawback, obviously, is that the rider needed to always be attentive to what gear they were in, and had to do a lot more work shifting. But electronic sequential shifting would take all the manual labor out of that: the rider could just shift up or down and always be in the right gear. This would allow for a 2×9 (or even 2×8) system with as wide a range as anything available today, with even tighter and more consistent spacing between gears.